It’s the destination on everyone’s tongues at the moment: Corsica. The earthly paradise in the middle of the Mediterranean sea is a combination of dense forest, majestic mountains and stylish coastal resorts. This makes it the perfect destination for a beach holiday, a family camping trip, a cross-country ski break or an active hiking getaway. 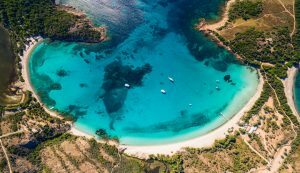 Corsica is a diverse island with plenty to offer and the best time to visit will largely depend on what kind of holiday you want! Temperatures also vary greatly depending on where you are located on the island. In the summer months, the temperature tends to hover around the late-twenties. Even in the winter months, however, the temperature is often around 15 degrees. There can be light rain between mid-November and mid-March, but nothing that will hamper a nice city trip in one of the island’s bustling towns. Both Ajaccio and Bastia are well worth a visit at any time of year and the low season is often a cheaper time to visit. Corsica, also known as the “mountain in the sea,” is an excellent winter sports festination. The cross-country skiing routes are extensive and famous for their beauty. Other sports activities on the island include white-water rafting and hiking through unspoilt interior of the island. 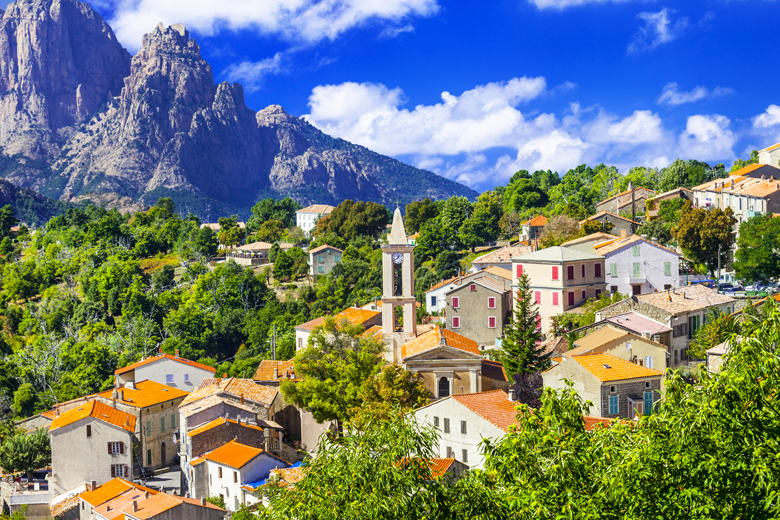 While in one of the mountain villages, make sure you taste some traditional Corsican cuisine. If you want to get a taste of the unique Corsican culture, Easter is the ideal time to visit. The island springs to life with the festival season. This is one of the busiest periods on the Corsican calendar, where ancient traditions are fused with Christian teachings. This is a fascinating experience for children and a great idea for family holidays in Corsica. If you’re on a culinary journey, this is the ideal time to taste Corsica’s traditional cuisine. Summer is ideal on the island, as the constant sea breeze stops temperatures from reaching sweltering peaks. It’s also the busiest time of the year. This may be great for family holidays in Corsica but if you’re looking for a quiet week away, we’d recommend Autumn or Winter. Corsica is like a mini continent, with an astounding amount of natural diversity. You can enjoy a glitzy city trip surrounded by glistening bays, perfect arched bays with azure waters, hiking and canyoning in the forests and mountains, or visiting one of the old-world hilltop villages and getting stuck into local life. Réserve Naturelle de Scandola is a highly recommended Unesco World Heritage Site. This magical waterland, surrounded by impenetrable rocks, can only be reached by the sea. The result is amazing natural preservation and beauty. Calvi is a beautiful Corsican town packed with history. The prominent fortified citadel is a must see for any history lover. Built by the Genoese governors, it defended the city multiple times over the centuries. 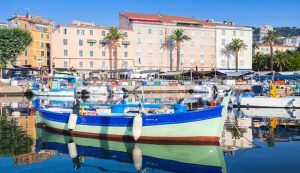 Bastia and Ajaccio are both bustling and lively towns, characterised by harbours, delicious markets, small churches and plenty of good food. Porto-Vecchio is also a beautiful town nestled into the dense forests and with a beautiful marina. The fastest and most straightforward way to travel to Corsica is, of course, by plane. The airports often don’t offer international flights during low season, so make sure you check carefully and well in advance. Another way to get to Corsica is by car. The ferries depart from France, Italy and Sardinia and vary greatly in price. Again, booking in advance is important when planning a holiday to Corsica. While there are plenty of hotels on the island, the resorts, campsites and holiday parks are often a popular option, especially for families. During high season, it’s important that you book well in advance. The island is so popular among holiday makers, especially from the UK, that holiday homes, cottages and villages can often book up. At HolidayParkSpecials, we have cheap holiday parks directly on the beach and for an excellent price. 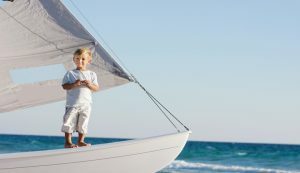 Have a look at our deals and enjoy an unforgettable family break on the glistening island of Corsica.